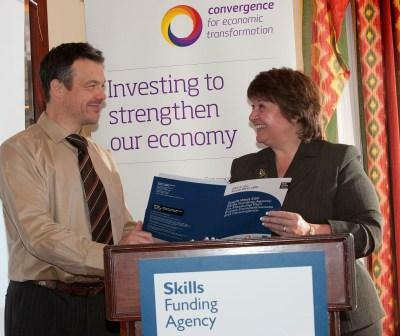 A presentation outlining phase two of ESF (European Social Fund) Convergence investment has taken place at the Headland Hotel. The Skills Funding Agency in Cornwall and the Isles of Scilly underlined the success of phase one and ran through future plans to an audience that included representatives from Jobcentre Plus, the National Offender Management Service and Government Office for the South West. A total of £153 million was awarded to the region in 2007 to finance the Convergence Programme – the successor to Objective One. That sum was intended to support two main priorities – £58 million was earmarked for tackling barriers to employment targeting the most vulnerable and hard to reach individuals and £92 million to improving the skills of the local workforce. In the first three years of the six-year plan, tens of thousands of young people and adults have taken advantage of the support – creating huge benefits to the local economy and people’s quality of life. Carleen Kelemen, director of The Convergence Partnership Office for Cornwall and the Isles Scilly, said: “These are interesting times. We all know we face a tsunami of changes in the public sector, but we also know that we are all here on an historic journey and we must continue regardless of the fear of seismic changes. We are here to leave a legacy for the long term. Mark Williams, head of provider accounts for the Skills Funding Agency, congratulated everyone on the success of this ESF Convergence investment, pointing out the high percentage of programmes which are on target. In particular he mentioned the success of projects that improve the skills of lone parents, people with disabilities or health conditions and those designed to encourage, support and create opportunities for businesswomen.